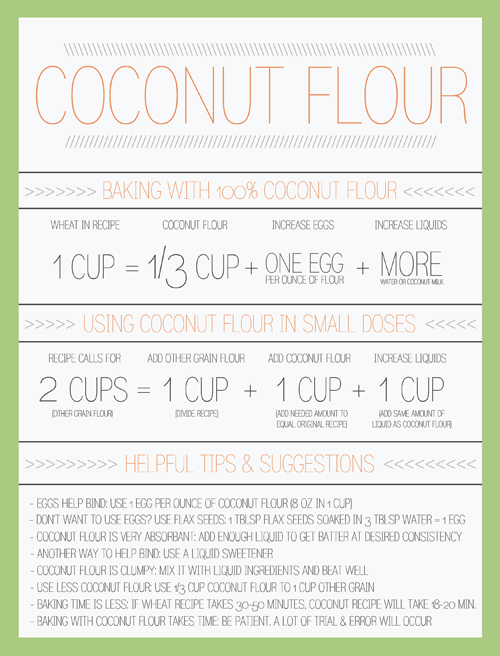 Since there have been quite a few recipes on Scientifically Delicious lately that use coconut flour, I wanted to share this wonderful conversion chart from Gygi’s blog to aid in your own experimentation. Coconut flour can be a little tricky since it requires more liquid than normal flours (remember how many eggs we used in those Green Tea coconut flour cupcakes?). To account for this, the liquid and/or egg amounts should be adjusted. Another idea is to combine coconut flours with other gluten-free flours (such as almond) to create your final product.